Death metal and Sweden have a special relationship, from the chainsaw attack of Entombed to the more progressive flair of Meshuggah and Opeth, to melodic scene of Gothenburg that spawned bands such as At the Gates, Dark Tranquillity and In Flames. The gravity of these bands shook the world and provided an alternative to the whiny angst of nu-metal. 20 years on and the world still looks back favourably on bands from Gothenburg, but that is by no means a free meal pass. Also hailing from Gothenburg are Vampire. Vampire mix a blend of good old thrashin’ death metal in the style of Possessed and Death with a pinch of home grown melody and it works sublimely, before you realise it, Vampire are on to something here. 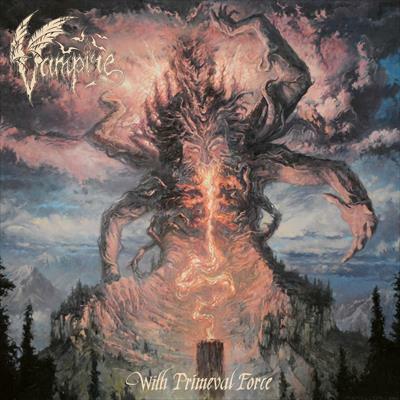 Vampire released their self-titled first album back in 2014 to a rousing critical acclaim and 2017 see’s the band release their highly anticipated second album; With Primeval Force. With Primeval Force begins with Knights of the Burning Crypt and the sort of riff that made In Flames famous before the unsheathing of a blade descends into a Death style verse that wouldn’t be out of place on Scream Bloody Gore. When you begin with a standard as high as this, you know what to come is going to be magical. Knights of the Burning Crypt has an outro that features acoustic picking alongside some excellent riffing that harks back To Mega Therion era Celtic Frost, whilst Scylla contains a choral outro which, in all honesty completes the album. With an album that clocks in at under 40 minutes, Vampire waste no time in smashing down the boundaries. He Who Speaks contains a hypnotic chanting chorus of Tlatoani; a word of Aztec origin as vocalist, Hand of Doom’s vocal tendrils creep out, pulling you into his thrall. Even by the second song on the album, With Primeval Force has you and any old school death metal fan would be a liar if they said they didn’t like or appreciate this album. The history links contain through songs such as Skull Prayer which contains references to Ashem, Deva, Namtar and Allatu, all of which have links to various religions such as those worshipped in ancient Mesopotamia, Persia and the Indian subcontinent, conjuring up images of hooded acolytes, chanting around a sacrifice. Tracks such as Metamorfosis and Skull Prayer would easily interest any Venom fan with its black metal lyrical leanings against the distorted guitar and double bass drum beat of death metal. These comparisons don’t just stop here, Midnight Trial once more has all the hallmarks of Death and Venom. However, Midnight Trial also adds a more thrash metal element to it and brings about a feeling of what would happen if Chuck Schuldiner covered Liar from Megadeth’s 1988 album; So Far, So Good… So What! with its quick fire rhythmic vocal delivery suiting the song perfectly down to the ground.